Hello again! I guess I sort of disappeared into my own distracted world for the past ten days. Just...things, ya know? I did start the commissioned chevron quilt for my friend's newest grandson (one of two). So there's some colorful goodness in the works. All the pieces ready to be put together. I tell you what, though. I had a devil of a time futzing around with the fabrics on this one. Norm helped, or tried to, but we both ended up walking away in frustration. The next day I woke up with the idea to take out half the fabrics we were trying to get to play nicely together. You know, separate the poor sports and all. I replaced those with a strip of Kona white in between, and now I like where we're headed! There was a garage sale down the street that I passed on my walk on Friday. The 90-year-old gentleman who lived there passed away a couple months ago. There was a lot of vintage outdoor sportsman type things in the sale, and I picked up a couple of antique handmade push paddles for my dad, who knew this gentleman. A push paddle is a pole about 10 feet long, carved of a solid piece of wood, with a paddle shape on the business end. It is used to push a boat or skiff through shallow waters or marshes where one doesn't want to or can't use a motor. Sort of like what a gondola pilot uses, except the paddle doesn't do any rowing, it just pushes off against the muck on the river bottom. I also bought this old occasional table from the same sale. What do you think, 1930s? Earlier/later? Cool shape to the top, huh? It's been a while since I revamped a table, and I've never used chalk paint and a wax finish before, so it'll be a new experience. If you have any tips or advice, feel free to leave them in the comments. It's rhubarb season here, and I've got a rhubarb-strawberry crisp in the oven right now (recipe found HERE). Here's how it looked going in—in Pyrex, of course! I was filing away some random old photos this week and came across this one, circa 1978, which made me laugh. 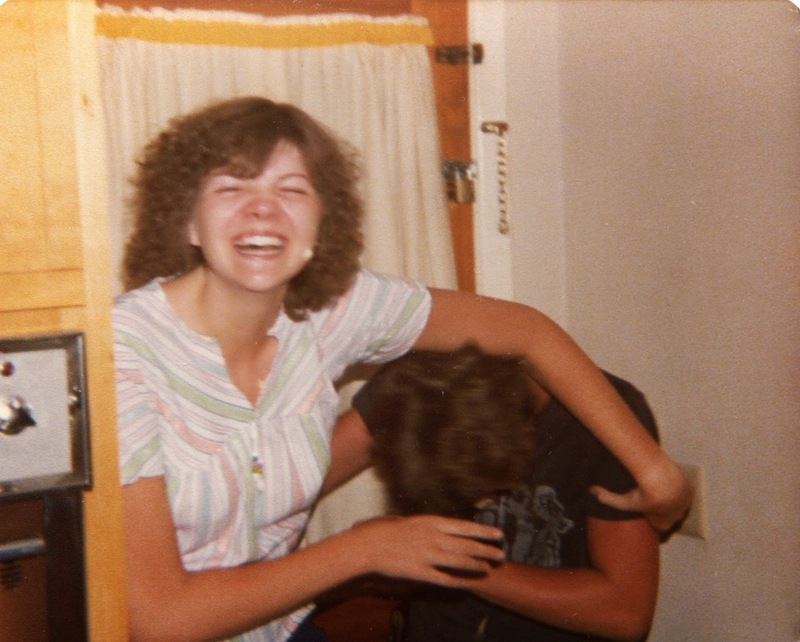 My cousin Kerry and I were having a food fight, chasing around his kitchen in Ocala, Florida. Looks like it involved something whipped creamy, judging from the stuff on my cheek. I've got him cornered and smushed his face with whatever it was. Hee-hee! Kerry still loves to instigate good, messy fun. He makes a living traveling the country, producing professional paintball events! that table will be great. I would use a red crackle paint after sanding and cleaning. Have fun! Those fabrics in your new quilt are playing very nicely, very nicely indeed. The table....earlier...later....don't really know...but this I do know, 'tis a lovely shape. It will look rather spiffy when you have tarted it up. The chevron quilt is looking good. I often let things ‘rest’ overnight . It helps with decision making and I think you made the right choice. Love the colours you have left. I love that table, but I would guess older than the 1930's - I'm not sure why, just the look of it. It's going to be gorgeous when you finish it! And yes, sometimes simpler is better! Well, I am finally at a point where I can visit blogs again! WHEW! I love your new acquisition, and I think the chalk paint will really be nice on it! Can't wait to see the commissioned chevron quilt(s)! I can't believe I haven't commented for a month. I think what stopped me on this one (b/c I read it) was that I didn't have time to listen to the music. I always like to give your posts 100% b/c you have good taste in music. This one doesn't disappoint. And sometimes you just have to separate the fabrics who won't play nicely. Love those pretty, bright colors. They are perfect for a baby quilt! I welcome your comments! Thanks for taking time to leave a note! I enjoy making quilts, sewing, vintage, thrifting, music, and more.